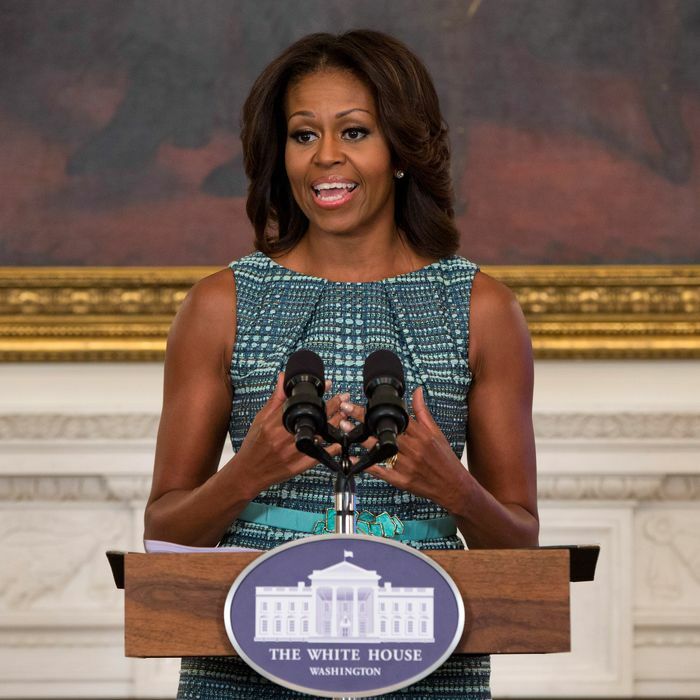 The First Lady continues her efforts to curb junk-food advertising aimed at children. Yesterday, she opened a summit on the issue and urged food manufacturers to basically use their powers for good, not evil. In an opening speech, she said she’s confident that companies can “remain competitive and profitable” by marketing things like actual fruit instead of Froot Loops. She also asked media companies to regulate how much junk-food advertising appears in their outlets (asking media companies to please be mindful about who’s buying advertising space is sort of like asking gun owners to please leave their firearms at home when they go to Starbucks — unlikely to resonate). In any event, it remains to be seen whether the First Lady’s efforts will do any good, but you can read the complete White House transcript of the speech straight ahead. So with that, we’re going to put you to work. Thank you again for being here. I want to start by thanking Sam for that very kind introduction, but more importantly for all the work that he and his team have done to make Let’s Move a reality. And I think it’s important to note that we’re having this conversation in the midst of what I believe is a cultural shift that is happening in this country – a transformation in how we live and eat that many of us could never have imagined even just a few years ago. I see it everywhere I go all across this country. I see it in chain restaurants that are serving kale salads, and they’re filling kids’ menus with not just nuggets and fries, but with broccoli and whole-wheat pasta. I see it in churches where instead of fried chicken and mac and cheese for church supper, they’re serving up grilled fish and brown rice. And all of you in the food and beverage industry delivered for me. You manufactured and sold the convenience foods I needed, and you did a brilliant job making those foods something my kids would want. So when I opened those boxes and bags, my girls were happy, and I was happy – problem solved. So once again, moms like me turned to your industry for help. But this time, we didn’t just want the foods to be convenient and affordable – we wanted them to be good for our kids as well. And once again, many of you have started to deliver by manufacturing some of the healthier options. And that is an important first step. But once again, moms like me are relying on all of you to actually help our kids get excited about eating that food. And that’s why I wanted to bring all of you together today – because you guys know better than anyone how to get kids excited. You’ve done it before, and we need you to do it again. And fortunately you have everything it takes to get this done because through the magic of marketing and advertising, all of you, more than anyone else, have the power to shape our kids’ tastes and desires. You all know that our kids are like little sponges – they absorb whatever is around them. But they don’t yet have the ability to question and analyze what they’re told. Instead, they believe just about everything they see and hear, especially if it’s on TV. And when the average child is now spending nearly eight hours a day in front of some kind of screen, many of their opinions and preferences are being shaped by the marketing campaigns you all create. And that’s where the problem comes in. And as you all know, these ads work. Kids who see foods advertised on TV are significantly more likely to ask for them at the store – a phenomenon known as “pester power.” (Laughter.) New to me. Sounds right though. And research shows that a child’s first request for a product happens as early as 24 months, and 75 percent of the time, this request takes place in a grocery store. And given what our kids are seeing on TV, it should come as no surprise what they’re asking for. One study revealed that 45 percent of kids’ food requests were things like cookies and candy, burgers and fries, and chips, but just 3 percent were for fruits and vegetables. So from the time our kids are still in diapers, we as parents are already fighting an uphill battle to get them interested in the foods that will actually nourish them and help them grow. Now, like many parents, Barack and I do our best to limit our daughters’ TV time. But as you all know, these ads aren’t just on TV. They’re on the internet, in video games, smart phones, billboards. They’re in schools and store displays. They’re everywhere, and parents just can’t keep up, no matter how hard we try. So whatever we all might believe about personal responsibility and self-determination, I think we can agree that it doesn’t necessarily apply to children. But of course, while limiting the marketing of unhealthy food is critical, it’s not enough. We also need companies to actually market healthy foods to kids – foods that have real nutritional value, foods that are fortified with real fruits and vegetables, whole grains and low-fat dairy. Now, I say this mindful that companies exist to make a profit, and they need that in order to survive. And those profits keep our economy going every day. But the fact is that marketing nutritious foods to our kids isn’t just good for our kids’ health – it can also be good for companies’ bottom lines. For example, the folks at Birds Eye Vegetables launched a major marketing campaign featuring characters from the popular kids’ show “iCarly.” And their sales jumped 20 percent in just two months. Vidalia Onion did a campaign with “Shrek” – one of my favorites – and their sales went up 50 percent. So I’m confident that you all can sell healthy foods to our kids and remain competitive and profitable. That’s why some of your companies’ marketers are playing a key role in a new campaign to inspire people in this country to drink more water. You see, we know that water is such an important component to good health, but so many other beverages have millions of marketing dollars behind them that water often gets drowned out. That’s why last week, we launched the new Drink Up campaign – a campaign to bring attention to water as a healthy choice so that when people are thirsty, they reach for a glass of water. So I say this because when it comes to believing in the power of marketing to promote healthy choices to our kids, I’m not just talking the talk, I’m actually walking the walk on this one. And that trust is valuable. That trust is good for your businesses. That’s why so many of you in the private sector are leading the way on this issue. You are innovating. You’re taking risks. You’re serving as models for your industries, and it’s starting to make a difference – not just for our kids, but for your shareholders as well. And I’m here today with one simple request – and that is to do even more and move even faster to market responsibly to our kids. Now, I want to be clear about what I’m asking here. I am not asking anyone to take the fun out of childhood. As we all know, treats are one of the best parts of being a kid. Instead, the goal here is to empower parents instead of undermining them as they try to make healthier choices for their families. And we need you to lead the way in creating demand for healthy foods so that kids actually start “pestering” us for those foods in the grocery store. And then parents actually start buying them, and then companies have incentives to make and sell even more of those foods. See, the decisions that you make about marketing won’t just affect what our kids are eating today – those decisions are going to also affect the health of your workforce tomorrow. Businesses are losing $37 [$73] billion a year due to absenteeism, lost productivity, and health care costs associated with obesity-related conditions. And just imagine what that number will look like in twenty years from now if we stand by and let today’s unhealthy kids grow into unhealthy adults who become the employees of tomorrow. And there’s another long-term factor that’s also worth considering, and that is the potential trend in our kids’ food preferences and taste. You see, over the past few years, we’ve seen some real changes in the foods our kids are eating,starting from the time they’re born. For example, changes in the Women, Infants and Children Program are helping millions of women across America buy healthier products for their kids. And 10,000 childcare centers across the country have committed to serving more nutritious food as part of Let’s Move Childcare. So there might be those out there whose strategy is to just wait this out – folks who might still be thinking to themselves, well, in a few years, this lady will be gone – (laughter) – and this whole Let’s Move thing will finally be over, so we can go back to business as usual. And I know that none of you here are thinking that way. (Laughter.) But if you know anyone who is – (laughter) – you might want to remind them that I didn’t create this issue, and it’s not going to go away three and a half years from now when I’m no longer First Lady. This issue has truly taken on a life of its own because it is affecting just about every family and every community in this country. Parents are increasingly anxious as they see their kids developing diabetes, high cholesterol, high blood pressure – conditions that would have been unthinkable to find in children just a generation ago. There are now 79 million pre-diabetics in this county, many of them young adults, and we’re even seeing people in their twenties and thirties having heart attacks and strokes. And I know it won’t be easy. I know you might have to take some short-term risks to get a long-term payoff. But that’s what great American companies do – they act boldly, they innovate, they take risks. And remember, it wasn’t that long ago that “going green” or taking your business online were considered risky endeavors. But throughout our history, the companies that saw where the future was headed and took that leap have been rewarded. So I hope that all of you will really engage. I hope that you’ll really talk to each other, and learn from each other, and come up with new solutions that will make a real difference for our kids. We want to hear from everyone involved in this issue – from industry leaders to advocates to researchers and to parents – because we’re all in this together. Thank you all. God bless you. Good luck and work hard.